Janet Jackson and wardrobe malfunction. Peanut butter and jelly. Sonny and Cher. Some things just go together. Sort of how I feel about Canadian-American actor Rick Moranis and the movies Honey, I Shrunk the Kids or Ghostbusters. Whenever I hear his name, I have immediate flashbacks of oversized Cheerios and milk splashing out of a giant bowl. But what happened to the guy with horn-rimmed glasses? What is he doing now? A comedy-genius, Moranis quietly vanished from acting in 1997, when he was last seen on screen in the movie titled ‘Big Bully.’ He had been slowly disappearing from the public eye after his wife’s death from breast cancer that had spread to her liver in 1991. Why the disappearing act? He chose to leave Hollywood to be a stay-at-home dad and raise his children. A few months ago (July of 2013), he opened up about his unpopular choice to walk away from fame at the peak of his career during a rare interview on Bullseye with Jesse Thorn. (Definitely worth a full listen if you’re a fan of Moranis.) The actor says he simply wanted to recreate the same wonderful childhood for his kids that he experienced. Well, stuff happens to people everyday and they make adjustments in their lives for all kinds of reasons, and there was nothing unusual about what happened or what I did. I think the reason people were intrigued about the decisions I was making, and sometimes seem to have almost admiration for it, had less to do with the fact that I was doing what I was doing and more to do with what they thought I was walking away from- as if what I was walking away from had far greater value than anything else might. I was trying to recreate a lot of the joy I experienced as a kid… [I] kind of decided to follow the adage of “90% of the success is showing up or being there” and I found that to be true. Just being there was the best thing I could do. That’s what I experienced with my mother at home all the time and so when my kids came home there was music and there were lights on there were great smells coming out of the kitchen and it was just always a joyous place to be and that’s what I wanted, what I wanted to create. I didn’t walk away from [my creativity], I applied all my creativity to my home life, to me kids, to my family. I was the same person, I didn’t change, I just shifted my focus. So does he miss acting? 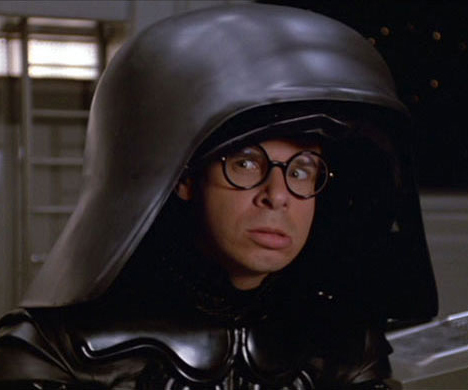 Will Moranis make a return to the limelight? After all, his kids are grown now. I’m a single parent and I just found that it was too difficult to manage raising my kids and doing the travelling involved in making movies. So I took a little bit of a break. And the little bit of a break turned into a longer break, and then I found that I really didn’t miss it. In 2005, Moranis released a comedy country song album, The Agoraphobic Cowboy, which ultimately was nominated for a Best Comedy Album Grammy. Just last May, he also released another comedy album, My Mother’s Brisket & Other Love Songs. How did Moranis get his start in comedy? His first job was selling programs at hockey games as a young teenager. To try to sell more programs and get a tip in the process, he started yelling out funny things like “Souvenir Hot Dogs, Ice Cold Programs…” Later, he wrote comedy sketches for CBS radio and television while still in high school, as well as worked as an afternoon deejay for CHUM-FM in Toronto. He moved on to performing comedy in a local troupe, which led to a television career with the popular TV series SCTV, where he won an Emmy for Outstanding Writing in 1982. Moranis eventually found himself performing on the big screen. Though we haven’t seen Moranis act since 1997, we have heard his voice on the big screen. His pipes were featured in the animated film titled Brother Bear in 2003, and Brother Bear 2 in 2006. Moranis turned down an offer to reunite with the cast of Ghostbusters to make a video-game version of the movie. Not that he didn’t consider taking the gig, but he says he just couldn’t make it work. Interesting, I had heard that he made so much money on the series of Honey, I Shrunk the Kids films, that he didn’t need to work anymore (which may have helped). Nice to have some more clarity. Good for him! Far too few people put their kids ahead of their careers. In Rick’s case, he could afford to do that and did! My Blue Haven is awesome, watching it now as I type this. I wish Rick would come back to do comedy films, he is so funny. If I had the money he made I probably would be also a “dad at home”…. so, nope.. at 55, still going from 9-to-5….